The Hawaiian Kona Isle Dancers will bring the spirit of aloha to Coastal Bend College Sunday, Nov. 14, at 3 pm in the Gertrude R. Jones Performing Arts Auditorium, presented by the Beeville Concert Association. The Austin dance group includes Maryjane Kesler, daughter of Beevillians Ben and Liza Rebugio and daughter-in-law of Jeannie and Justin Kesler. Their granddaughter Aurora also dances with the group. Hawaiian Kona Isle directress Carole Stockton has been dancing since her earliest recollection. Born and raised in Hawaii, she dabbled with ballet, tumbling, ballroom, Mid Eastern and Flamenco dancing. However, her heart and spirit has always been with Hawaiian/Polynesian dancing. As a youngster she received early training at the neighborhood recreation center studying with kumu hula Blossom Kaipo. For a while she put dancing aside for her education and a career as a teacher. Now as a retired school teacher she is able to fulfill her dreams of in-depth study of Polynesia, choreographing new dance routines, and devoting time to her business and the community. She returns to her home at least once a year to study with her kumu hula and friend Iwalani Tseu. The Hawaiian Kona Isle dance show is an entertaining revue of the dances and music of the islands, including the graceful storytelling dances of Hawaii, the fast pulsating hip movement of Tahiti, and the fascinating Maori poi ball dances of New Zealand. The show features beautiful authentic costuming (including tall colorful headdresses and other island garb)typical of the South Pacific region. The dances from Hawaii, through graceful movements emphasizing the hips and hands, tell a story about life in Hawaii. Music for the dancer includes the uli uli (feather gourds), pu’ili (bamboo) and ipu (gourd drums). 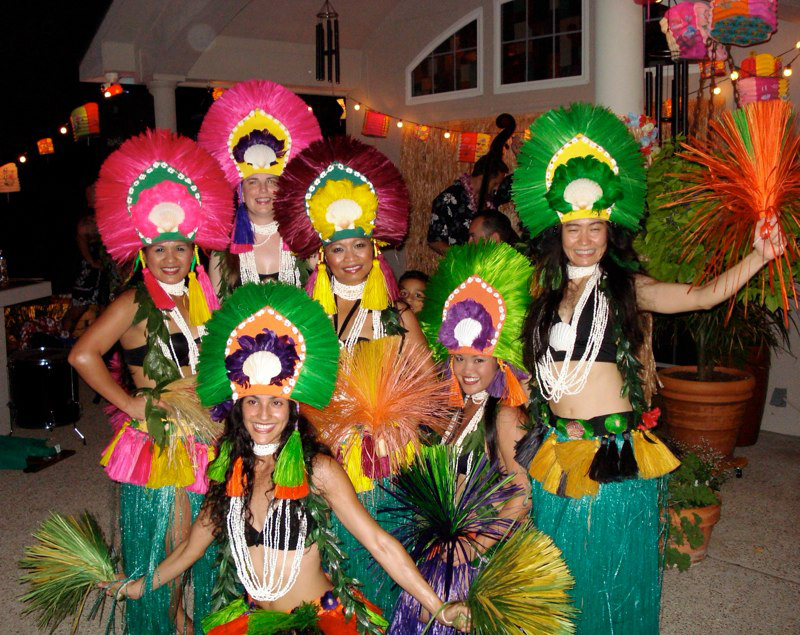 For the Tahitian selections, dancers wear beautiful tall headdresses, grass skirts and hand tassels as they perform the Otea, moving their hips to the fast, pulsating drum beats. A New Zealand dance features Maori poi balls attached to long cords, which are twirled and swung about the body to form patterns, in a lasso-like high-energy display. Canoe dances are also performed to tell a story of the Maori people migrating by canoe from Polynesia to New Zealand. Samoan rhythm dances are performed with Lapa sticks, and a dramatic fire/knife dancer gyrates, leaps and spins while juggling a flaming fire knife to a rapid, primeval drum beat. Hawaiian Kona Isle was established in 1989 when the group entertained at the Austin Aquafest International Night. Since then the group has entertained at local and statewide events, private parties, country clubs, and charitable events. The performance is $10 at the door for adults who do not hold BCA season tickets or CBC student ID’s. All children and students through high school age are admitted free.